WATERFRONT LIVING AT ITS FINEST IN THIS CUSTOM-BUILT HOME WITH 600 FT PRIVATE LAKE MICHIGAN ASSOCIATION ACCESS in this exclusive gated community of Highfield Beach. 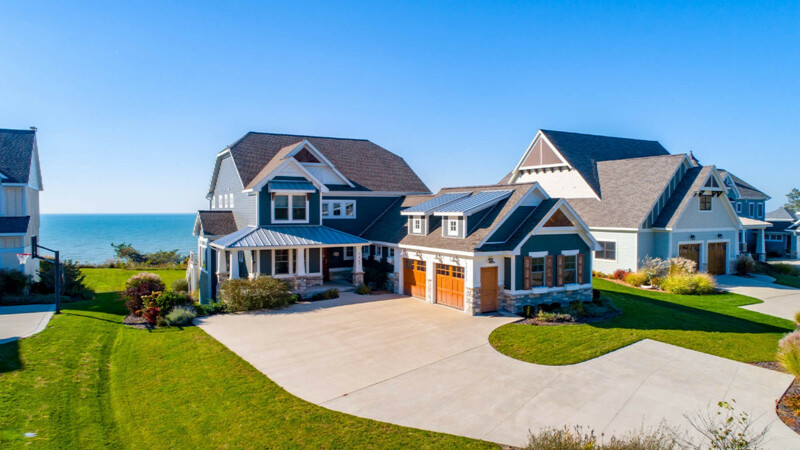 This exquisite lake Michigan property offers every amenity with 3 levels of finished living space, comes FULLY FURNISHED (even includes the golf cart) and almost 5, 200 sq ft of finished living space. Featuring custom hardwood and vinyl flooring, built in mudroom bench, functional open floor plan, the entryway greets you warmly. The kitchen is marvelous with granite countertops, center island snack bar, subway tiled wall, stainless steel appliances, all with views of Lake Michigan. Open the sliders to hear sounds of the lake and enjoy stunning sunsets from the composite wood deck. The living room offers unique wood beamed Open the sliders to hear sounds of the lake and enjoy stunning sunsets from the composite wood deck. The living room offers unique wood beamed ceilings, a stacked stone gas log fireplace with built in TV, and easy access to the formal dining room and second bedroom. The upper level master suite is your own private oasis with a private covered deck, a huge full bathroom with stone walk in shower, jacuzzi tub and double vanities. The upper level hosts 2 more spacious bedrooms and has a large family room! The lower level showcases another spacious bedroom, bunk room, a huge family room with Granite wet bar, Game table, cozy stone fireplace, and door to the lower patio, welcoming you to the beach. This high-end community offers a maintained beach, heated outdoor swimming pool, clubhouse with kitchen, and fishing pond. Amazing is an understatement! Call today for a private tour!